Last month, I had shared about the Reisenthel Mother Child Tote Bag I had come across online. I also expressed how I wish there was a similar bag with handles that a child could hold onto that was more fashion-forward. I still have not found a handbag especially designed for that purpose, but I did come across this 2-in-1 Metallic Hobo sold by The Gap. This tote was designed to be folded over to create a single-handled hobo style handbag, but can also become a roomy double-handled shopping tote when unfolded. When I saw this bag, the first thing I thought of was how the double handles could be used for a child to hold onto. 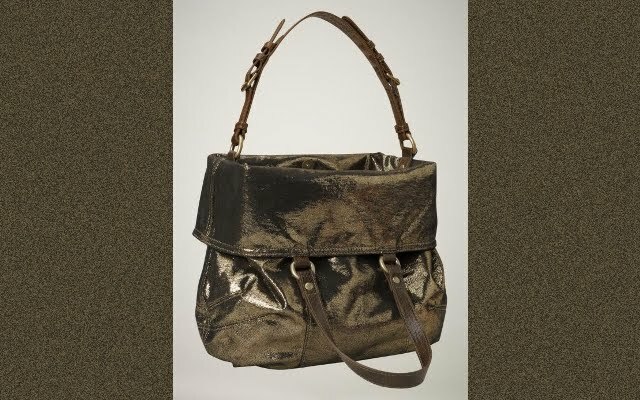 This bag pictured is shown in a dark gold, but it also comes in a metallic black. The 2-in-1 Metallic Hobo retails for $49.99, but is currently selling for $41.99 on Gap.com. You could probably find a Gap coupon online to make the deal even sweeter. Which color would you choose? I really like the dark gold, but I think I would get more use out of the black.